Vic Batista: There are two words there in Isaiah 53:7-9 that I kept noticing, and it's the words "cut off." The Suffering Servant was cut off. I believe there's a prophecy in Daniel 9:26 which talks about the Messiah being cut off? Nathan Jones: Yes, the Messiah was cut off from the land of the living. In other words, He came as a human so that He could relate to mankind and we in turn could understand God, but also to bear the punishment for our sins. He was the perfect God and man who was cut off from humanity. He was cut off from life here on earth. But, He beat death by being resurrected back from the dead. Because of Jesus' victory over death, we too can have that victory over our sins and our death sentence. But, God doesn't want us to be burdened. He wants us to be rescued from our sins. He wants to clean us and make us whole. He wants to give us eternal life. He made that possible by crushing His own Son, as verse 10 reveals: "Yet it was the Lord's will to crush him and cause him to suffer, and though the Lord makes his life an offering for sin, he will see his offspring and prolong his days, and the will of the Lord will prosper in his hand." Vic Batista: That's why every time we see a cross, it should remind us of God's love. His hands are extended out, showing us how much He loves us. I want people to know that God loves them and has a plan for them. Even though we've failed at times, and maybe we've sinned and messed up, a person can always turn around and repent. The Bible is clear that God forgives us of our sins when anyone truly repents, right? Nathan Jones: Exactly, for verse 11 I think is the best part, because it says that after He has suffered, "He will see the light of life and be satisfied…," in other words the Messiah would be resurrected, and "…by his knowledge my righteous servant will justify many, and he will bear their iniquities." Vic Batista: There is so much in Isaiah 53 that we can learn, and it's only 12 verses long. The chapter is short, but packed with prophetic information. Nathan Jones: Yes, verse 12 is one of the best. I believe it is the greatest verse in this prophecy. It reads, "Therefore I will give him a portion among the great," "I" meaning Jesus Christ, "and he will divide the spoils with the strong, because he poured out his life unto death, and was numbered with the transgressors. For he bore the sins of many, and made intercession for the transgressors." Jesus Christ is the King of the world. He just needs to come and take the world back. On the cross Jesus already beat Satan and He beat sin, so all He needs to do is return and set up His Kingdom. Christ earned the throne because He defeated evil and He defeated death. 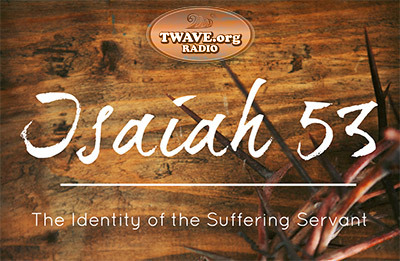 Through the Messiah's suffering and through His death we have salvation. Nathan Jones: Exactly. Jesus came first as a Suffering Servant. He's compared to a defenseless lamb. That's where we get the name for our ministry, Lamb & Lion Ministries. Jesus came first as the Lamb of God. But, when Jesus returns, He is coming back as a Conquering Lion to defeat evil and set up His Kingdom on Earth. That is what true believers in Christ are anxious to see. Jesus came as the suffering, sacrificial Lamb, but He is soon returning as the Conquering Lion. Praise the Lord He is coming soon! Nathan, give an invitation to anyone who doesn't have a relationship with the Suffering Servant. Could you share briefly how someone can start that wonderful journey today? Pray from your heart something like, "Dear, Jesus, please forgive me of my sins and be my Savior." Jesus promises to forgive you of your sins, give you a whole clean and new life here in this life, and the promise of life forever with Him in Heaven.